Teaching and knitting are passions for Harry. 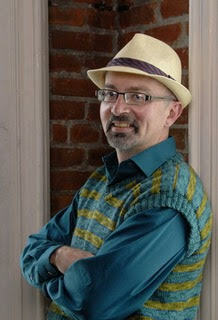 In 2010, he retired from being a university professor to pursue knitting fulltime. His extensive experience in classroom presentation and course preparation makes for an organized and engaging learning experience. He managed the Northcoast Knittery in Eureka, CA from 2010-2017 and enjoys designing, including publishing patterns in magazines and on Ravelry. His design aesthetic emphasizes texture and linear flow. He designs mainly with men in mind, but his accessories almost always end up being unisex in appeal.